The Rifts® have officially opened on Kickstarter and The Tomorrow Legion now faces off against new apocalyptic threats from the darkest corners of North America and Earth’s ancient past! And we’re pleased to report the new campaign funded in just seven minutes! Building on the incredible success of Rifts® for Savage Worlds comes three new Worldbooks further detailing the factions, locations, and threats of Rifts® North America. Inside you’ll find new allies, armaments, and abilities to aid Tomorrow Legionnaires in their fight against the evils of the Megaverse®. 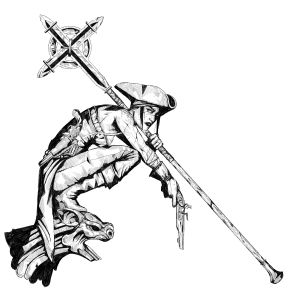 Arcana & Mysticism: Explores the Federation of Magic, Psyscape, and Techno-Wizard enclaves throughout North America, and the dire threats hiding within. Blood & Banes: Details the struggle of dark heroes against the alien Xiticix Hivelands, encroaching Vampire Kingdoms, mysterious Dinosaur Swamp, and insanity of Madhaven. Empires of Humanity: Brings to life the wonders of human civilization from the Coalition States to the New West, and uncovers the secrets of the east coast. 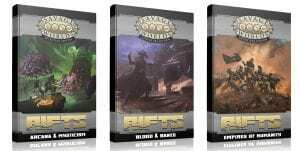 Best of all, not only can you get these three NEW Worldbooks for Rifts®, we’re also printing revised and updated versions of the original core Rifts® for Savage Worlds books (The Tomorrow Legion Player’s Guide, Game Master’s Handbook, and Savage Foes of North America) and making it easy for you to upgrade as well! These deals are only available during this Kickstarter and pledge manager. After that they’ll be listed at their full retail price. Head over to the Rifts® for Savage Worlds: American Armageddon Kickstarter page RIGHT NOW to find out more and to pledge your support. The Tomorrow Legion is counting on you! Our thanks to Marc Nuar and Christopher Landauer for pulling this document together for us. 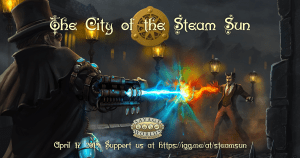 From “Ace” licensee, Steam Sun Games, comes The City of the Steam Sun, a new setting for Savage Worlds Adventure Edition that casts players into the gloomy realm of steampunk Limbo: an explosive mixture of steam technology and ancient magic, where mystical Victorian horror and adventure are played out under the dim rays of a metal steam sun! Mathematically calculated, the City was to become the new Utopia of the rational age, but the disaster changed everything – the City fell into Limbo, the threshold of Hell. Progress faced ancient magic. The City became a part of Limbo, with no sunlight. The familiar world doesn’t exist anymore. There are other laws and other creatures here – but the scientific method maintains even in the maddest conditions. People lit their steam Sun here. Every morning it rises over the City on a huge rail. The authorities lead diplomatic negotiations with demons, inventors dream of the creation of a conscious automaton, and researchers dig for traces of ancient civilizations. Scientists and frauds, adventurers and magicians, evil geniuses and brilliant detectives… humans and demons. All of them dwell in the City of the Steam Sun. 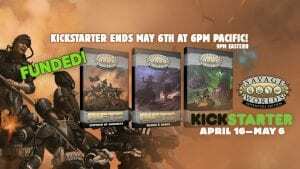 Visit The City of the Steam Sun Indiegogo page now to find out more about this unique setting and to pledge your support. And be sure to download the 44-page FREE JumpStart available now from DriveThruRPG. 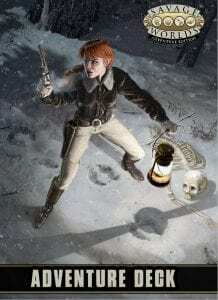 The Savage League of Seekers is a setting for Savage Worlds from “Ace” licensee, Feral Gamers, Inc. (Ghost Ops: An RPG of Covert Operations) that blends Lovecraftian terror with folklore to create an alternate 18th century Europe living under the fear of “the blood curse,” a horrific plague that transforms normal people into monsters. Events over the last millennium have unlocked the spheres that hold the gates closed to cosmic horrors and dark gods, which in turn has led to cults and secret societies spreading across the known world. 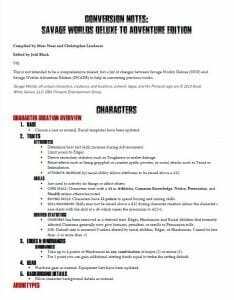 The Savage League of Seekers Roleplaying Game introduces you to a world of dark horror, where players can make characters that carry the blood of the Nodens in their veins giving them powers beyond mortal men, or a secret Muslim sect that has been fighting the evils betwixt the angles since Abdul al Hazred stumbled into the city of Damascus in 740 AD, or even as sires of Vlad Tepes, known as Count Dracul, who holds back the forces of the Ottomans in the East with his army of Vampyrs! 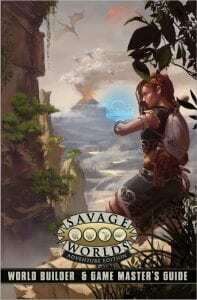 The Savage League of Seekers uses the Savage World Adventures Edition (#SWADE) rule system and features all-new Edges and Hindrances, new skills like Dark Knowledge and Psychology, and new rules for Insanity. The game also covers Europe via London, Paris, and Germany, crosses the wide ocean to the New World and the American Colonies, and bravely delves into the Dreamlands. If you’re a fan of H.P. 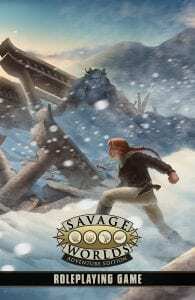 Lovecraft, movies like Brotherhood of the Wolf, or video games like Bloodborne, then check out The Savage League of Seekers, available now from DriveThruRPG. And be sure to follow Feral Gamers, Inc. on Facebook.